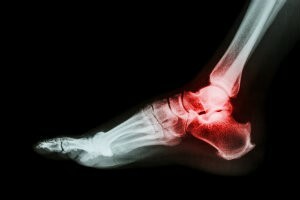 How do I know if I have a stress fracture in my foot? | Podiatry Associates, P.C. How do I know if I have a stress fracture in my foot? Sometimes it can be hard to tell that you have developed a stress fracture in your foot. The symptoms, however, should be telling enough to convince you that something is wrong with your lower limbs. Cracks in your bones are quite painful, especially under pressure. Since this is an overuse injury, the discomfort develops slowly, increasing with time as the condition worsens. Often your foot feels better when you rest. You might notice some swelling around the cracked bone. Most likely that spot will be tender to the touch as well. In some cases, you may even notice bruising. The only way to be sure you have a stress fracture is to have the problem diagnosed. Our team will carefully examine the injury. Typically we use diagnostic images to get a clearer picture of any damage, as well as to rule out other possible problems. If you do have a stress fracture, we’ll move forward with treatment. Don’t wait to have your symptoms investigated! Contact Podiatry Associates, P.C. for an appointment. Call (303) 805-5156 to reach our Parker and Castle Pines, CO, offices.